One of the best things about Slimming World (aside from mountains of nommy food and the best cross trainer workouts) is…nommy desserts that they give you in the magazines. The other night I had a real craving for chocolate cake and thankfully had ripped this recipe out of the Slimming World magazine for future reference. It takes about 5 minutes and although it doesn’t taste as nice as a chocolate cake covered in icing and ganache and chocolate sprinkles, it’s still very yummy. I adapted it slightly from the original recipe — it’s supposed to have chilli in it and vanilla — so I’m officially re-naming it and calling it an adaptation recipe. Okay. Put the spread in a microwavable bowl and microwave it until it melts — about 15 seconds. It will resemble little more than a smear on the bottom of the bowl. 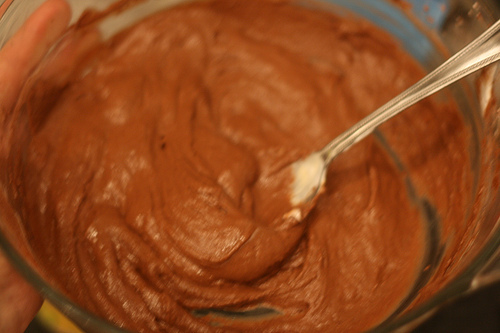 Then add the flour, the sweetener, the cocoa powder, the eggs, the yogurt, the almond extract and then mix together until there are no lumps. Spray two teacups with Fry light and divide the mixture equally between them. Ideally they should be adorable, tiny, cute little teacups…but that’s just aesthetics. Microwave for two minutes on a high setting. Whilst it’s cooking, put the fruit in the yogurt and serve with the cakes. Cute, delicious and only 5 1/2 Syns. Nom.